Sample Visual Studio 2017 solution. Includes C# and VB projects. 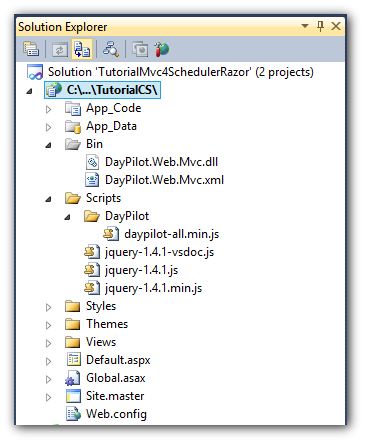 Copy the Demo/Themes directory from the DayPilot demo project to Themes directory. 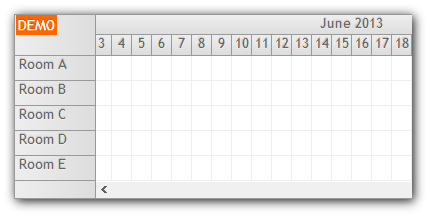 This will add an empty Scheduler with default settings. Apply the "scheduler_white" CSS theme by setting Theme="scheduler_white". Note: You can create a custom theme in the online CSS theme designer. 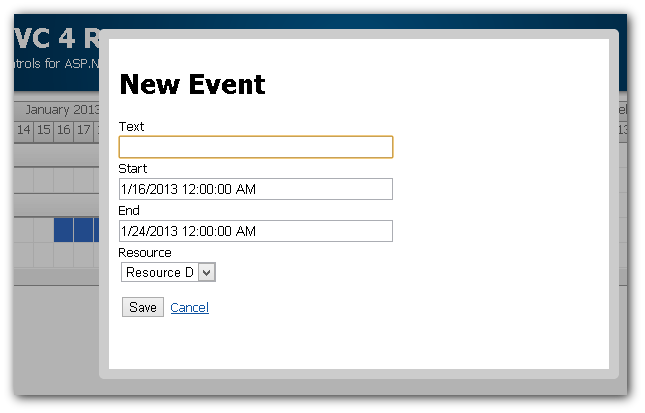 It maps the event set fields (id, start, end, text, resource) to DayPilot fields. It tells the Scheduler to refresh the events and show a welcome message on the client side. You can load resources using the Resources collection on the server side. It tells the Scheduler to refresh the events using Update(). You can see that the steps 2-4 are the same as in OnInit(). We can move the events reloading to OnFinish() method which is called during every CallBack after the main event handler. Similar steps have to be applied in order to enable event moving using drag and drop.